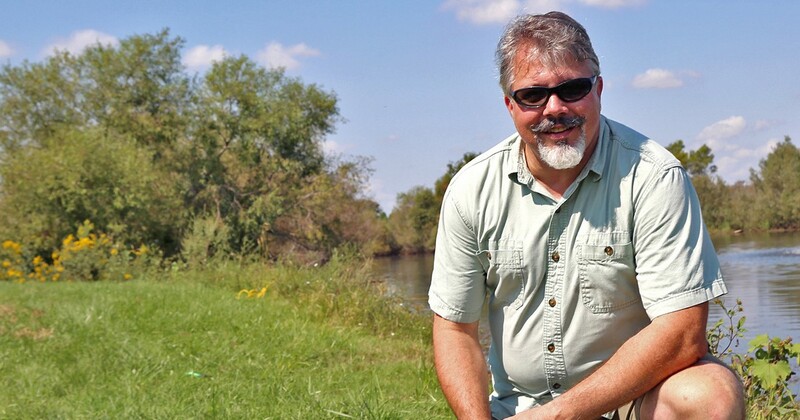 For Eugene Braig, aquatic ecosystems expert (and guitar hero), it’s all about being in tune. Eugene Braig has a passion for water — for Ohio’s ponds, rivers, lakes and streams; for the myriad things that call it home, from yellow perch to pickerelweed, smallmouth bass to microscopic plankton; and for making sure all its parts are in tune. As aquatic ecosystems program director for The Ohio State University’s College of Food, Agricultural, and Environmental Sciences (CFAES), Braig keeps a busy schedule sharing his expertise with, among others, pond owners, agency workers, people who live along streams, and officers in homeowners’ associations tasked with managing their lakes. It’s work that gets him jazzed. Though on a side note his musical talents are classical: after hours, he is artistic director of the Columbus Guitar Society. “To provide value to society gets me really fired up,” says the affable, handlebar-mustached Braig, who has duties with two of the units in CFAES: the School of Environment and Natural Resources (SENR) and Ohio State University Extension. Managing fish, controlling aquatic plants, coping with Canada geese and dealing with blue-green algae are some of the matters he helps people with. By his own estimation, he gives about 300 individual consultations every year and 50 to 60 talks to groups. Among them recently were homeowners’ associations in Westerville and Toledo (“I work a lot with homeowners’ associations,” he says), OSU Extension’s Ohio Certified Volunteer Naturalists program, the Ohio Watershed Leaders Conference, and the Urban Landscape Pest Management Workshop. At CFAES’s Farm Science Review trade show last week in London (pictured), he gave talks called “Is My Pond Toxic? Managing Harmful Algal Blooms” and “The Ever-Flipped Pond: Better Water Quality Through Aeration” twice each in the Review’s Gwynne Conservation Area. One of his algal bloom talks, a fast-moving 30 minutes, drew about 20 rapt listeners — pond owners, farmers and others. Under a red- and white-striped awning, shaded from the day’s heat and sunshine, Braig gave them an engaging, fact-filled primer. He covered, for example, the different kinds of bloom-causing blue-green algae, algae and tiny plants that aren’t a concern, the risks from bloom-produced toxins, treatment options, even chemistry, explaining phosphorus and nitrogen and how their ratio affects the blooms. Audience members asked questions about chemical control, the effect of water depth and whether bloom toxins get into fish. Afterward, a knot of a half dozen attendees, sunhats on, sunglasses on, walked with him back to the Gwynne’s main tent, asking more questions as they went. Braig grew up on the north side of Elyria, west of Cleveland, about 7 miles south of Lake Erie. He studied environmental education at Ohio State. Then he returned to the lake to do graduate research in fisheries biology at Ottawa National Wildlife Refuge, west of Port Clinton, and to take graduate courses at Stone Laboratory, Ohio State’s island campus at Put-in-Bay. Later, before joining SENR and OSU Extension, he was assistant director of the lab and its partner Ohio Sea Grant program. (Stone Lab is part of CFAES; Ohio Sea Grant’s educators get support from OSU Extension). Today, his weeks are filled with outreach — with helping Ohioans help their water — along with research and teaching. He teaches fisheries management for SENR. He is co-principal investigator on several grant-funded research projects. After his talks at Farm Science Review, he traveled to Hilliard’s three high schools, near Columbus, to speak to students about pond ecology and careers in aquatic sciences. Then he went to his home, which is aptly located on the Olentangy River, packed a bag and drove north to Stone Lab. There, he spent two days co-teaching a workshop on ways to sample fish — how to use trawls, gill nets, electrofishing and other methods to collect fish for scientific studies. The program is aimed at college students who’d like to work in fisheries biology, whether just for a summer or as their careers. Colleagues of Braig’s from two state agencies, the Ohio Department of Natural Resources’ Division of Wildlife and the Ohio Environmental Protection Agency’s Division of Surface Water, co-teach the workshop with him. Together, they’ve held it for 12 straight years. “It makes the students more marketable to agencies, and provides the agencies with better-trained workers,” he says. Like all of his work, it comes down to water, and to sustaining water’s future. “I grew up fishing the Great Lakes region with my grandfather, first at age 2, but not with any seriousness until 5 or so,” Braig says. Plus a touch of classical guitar.